Sueshiro and Mr. Sato lectured about mahogany bicycles and speakers at the Ibaraki University on August 11, 2013. After the lecture, the large lecture hall was filled with sweet sound from mahogany speakers. Coverage of SANOMAGIC on August 25 and 31. Introduction of Mahogany Bike No. 17 and new mahogany speaker having graceful curves. The large hall of the Ibaraki University. Mahogany Bike T2 is placed on a rostrum. Mahogany Bike T2, curved mahogany speakers, and large mahogany speakers were prepared for the lecture. Mr. Sato is setting a computer. Some attendance began to enter the hall. the entire hall to accommodate 300 people was filled with beautiful sound from the small mahogany speakers. Their speaker cones have a diameter of only 8 cm. I visited SANOMAGIC on August 25 and 31 to see Mahogany Bike No. 17 newly completed. Mahogany Bike No. 17 has a telescopic seat post, which improves the elasticity of the mahogany frame. Please watch the bike from eight directions. The weight of this bike is the 7kg-range without pedals. I, Kobata, rode the bike 17. According to Sueshiro, the frame is designed to have a slightly higher rigidity. But, the frame successfully absorbed the vibration from the road, it offered a comfortable ride at a high speed. Sueshiro will shave the mahogany frame to improve the elasticity of the frame. Mahogany Bike No. 17 will be looked after by the owner with an affection. The mahogany hollow handle is strong but astonishingly absorbs vibration from the road. Each of the SANOMAGIC mahogany bikes can be identified by the grain of mahogany. The mahogany saddle for supporting the owner. Taking a photograph with Mahogany Bike 7 and Mr. Chomei. Mr. Chomei and his Bike 7 is going to take part in the Japan Mountain Cycling in Norikura 2013 on September 1. 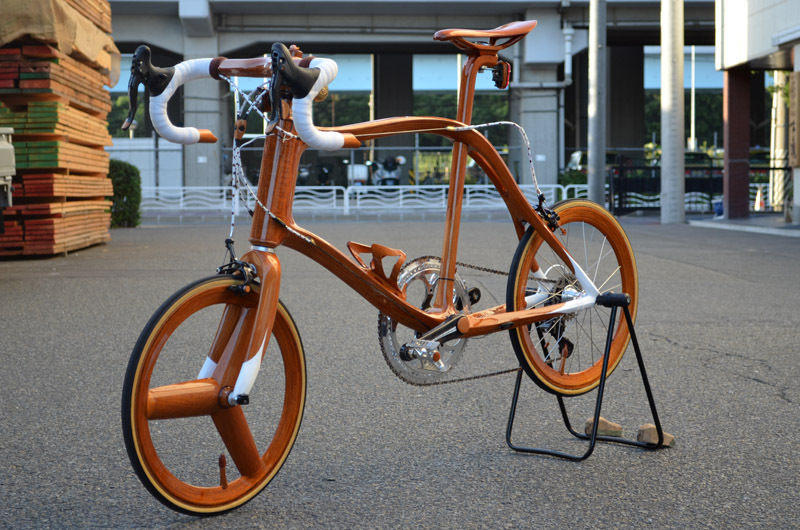 Mr. Chomei asked Sueshiro to shave the mahogany frame of his Bike 7 to improve the frame assist effect. Sueshiro explains how he has shaved the frame. Please click the image. The curved mahogany speakers were further modified to have elastically-supporting bases. The quality of sound was further improved. According to Sueshiro, curved mahogany speakers are very difficult to produce than box-type speakers. The curved speaker No. 1 which filled the Ibaraki University's large hall with sweet sound. Sueshiro is making curved mahogany speakers No. 2 using the experience obtained from the first curved speakers. and the plates were laminated in five layers with a special adhesive. between two side plates and smoothly emitted from baffle holes. Front panels of the mahogany speakers were subjected to marquetry. An elastically supporting base for the curved mahogany speaker No. 2. On August 31, I went to watch the completed curved mahogany speakers No. 2. This speker box has a horizontal cross section like a Braun tube. Sueshiro considers at present that this shape is the best for producing pure sound. 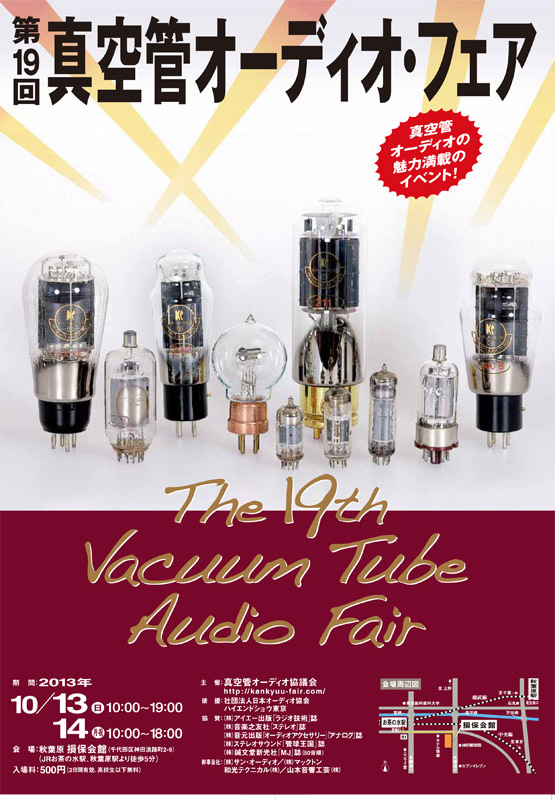 in preparation for the 19th Vacuum Tube Audio Fair which will be held on October 13 and 14, 2013. Please come to the audio fair to listen to the sound of the SANOMAGIC mahogany speakers. Please click to download the leaflet. Mini Wheel Road No. 2 came to SANOMAGIC with white cables dotted colourfully.